Dragon Ball is the signature annual benefit gala for Yee Hong Foundation. 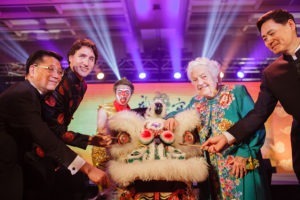 It is one of Toronto’s premier gala events and the largest fundraising gala in North America celebrating Chinese New Year. Every year, you’ll find a who’s who of the Greater Toronto Area’s top business, political and community leaders in attendance. Throughout the evening, patrons are greeted with a variety of exquisite cuisines in addition to the four course gala dinner, while the silent and live auctions present guests with opportunities to acquire unique items or experiences. Proceeds from the event go to support the culturally and language appropriate care and services provided by Yee Hong Centre for Geriatric Care to seniors of various ethnic backgrounds in the GTA. Yee Hong relies on the help and generosity of companies to support our tradition of excellence in seniors’ care. Dragon Ball offers unique branding and marketing opportunities for both large corporations and small businesses alike, to reach a diverse and influential group of consumers. For more information on sponsorship opportunities at Dragon Ball, please contact Linda Tse at linda.tse@yeehong.com or 416-321-0777 x1808, or click here to download the Dragon Ball 2019 Sponsorship Package. For more information on Dragon Ball, please visit www.yeehongdragonball.org or contact us at foundation@yeehong.com or 416-321-0777.